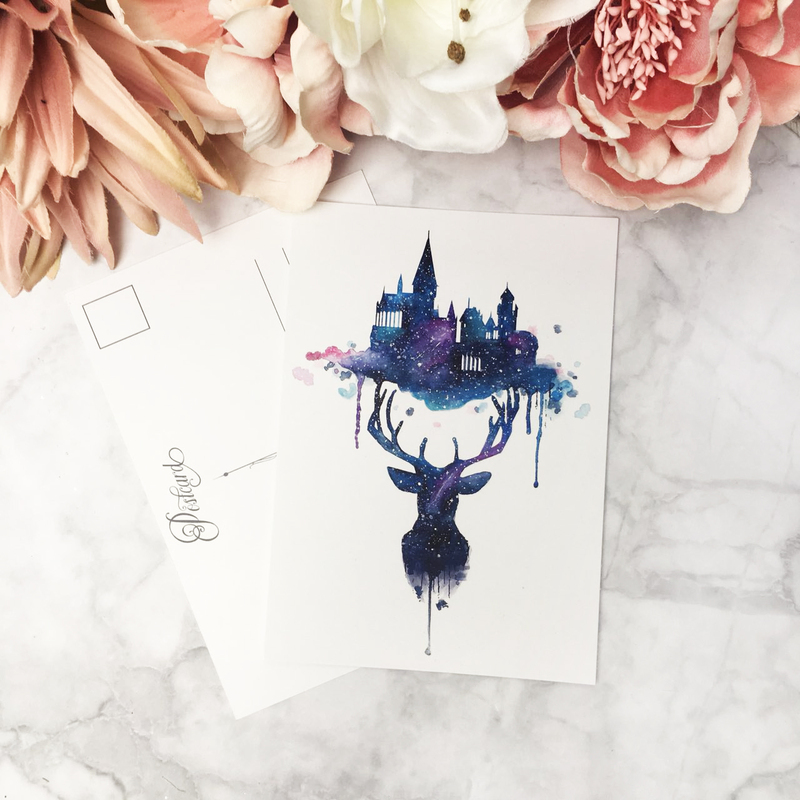 This cute watercolor postcard is inspired by Harry Potter. 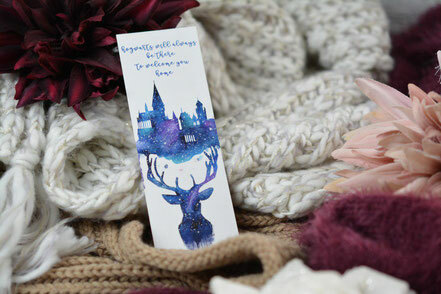 Showing Hogwarts and Harry Potters Patronus. 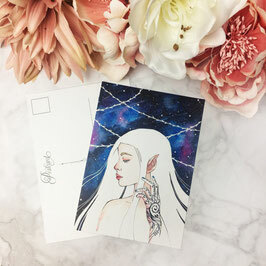 The design is available as a bookmark and postcard. If you choose this option, you'll get both. 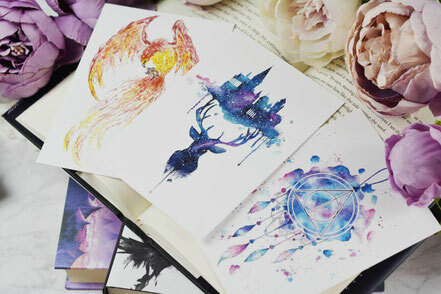 This cute watercolor postcard is inspired by Harry Potter. 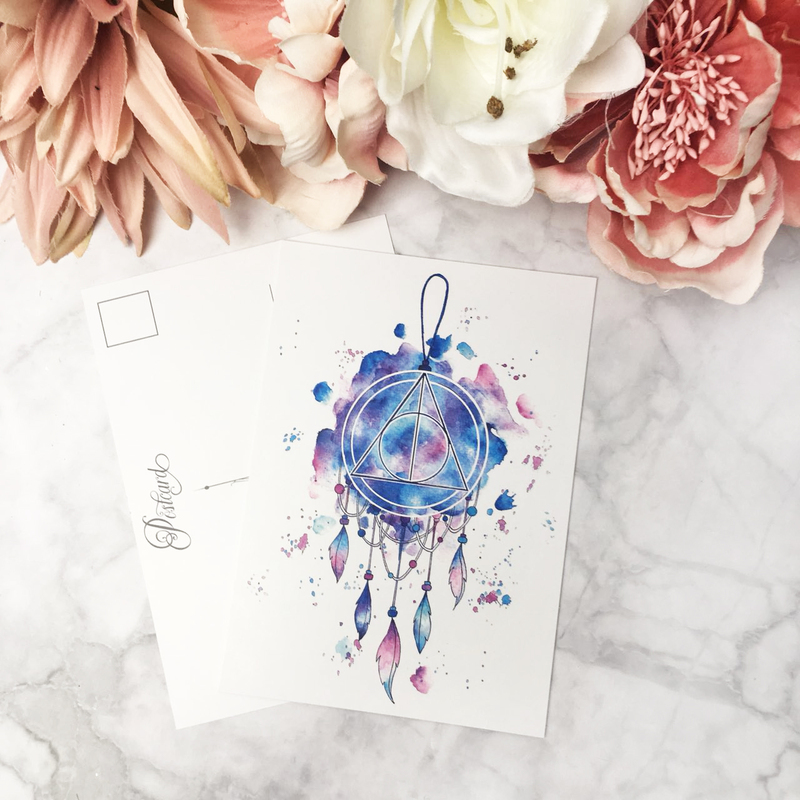 Showing the Deathly Hallows symbol in a dreamcatcher. 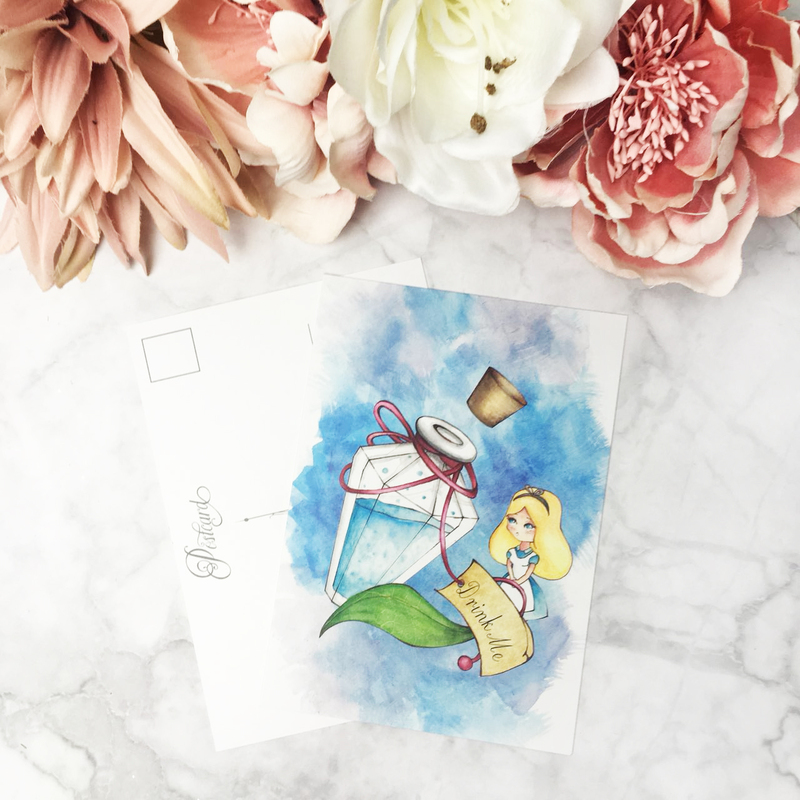 A cute watercolor postcard inspired by Harry Potter. Showing the Phoenix Fawkes. 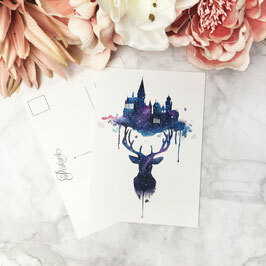 A cute watercolor postcard inspired by Harry Potter. Showing the Deathly Hallow symbol in a minimalistic galaxy painting. 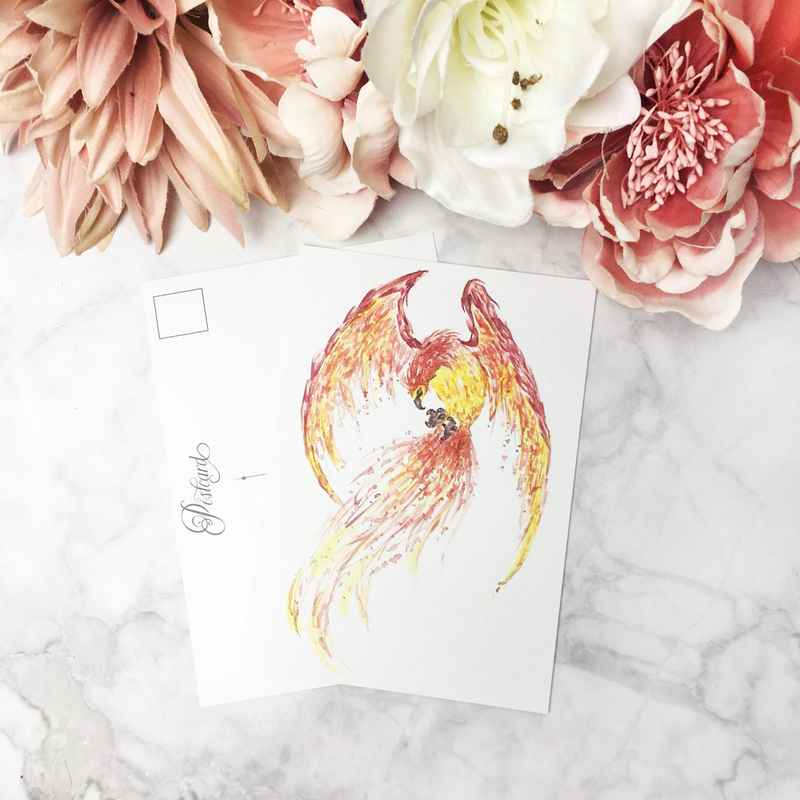 A cute watercolor postcard inspired by Fantastic Beasts. 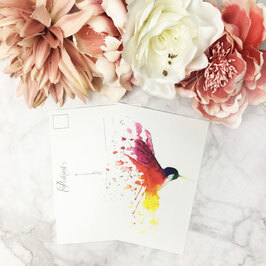 Showing the beast Occamy. 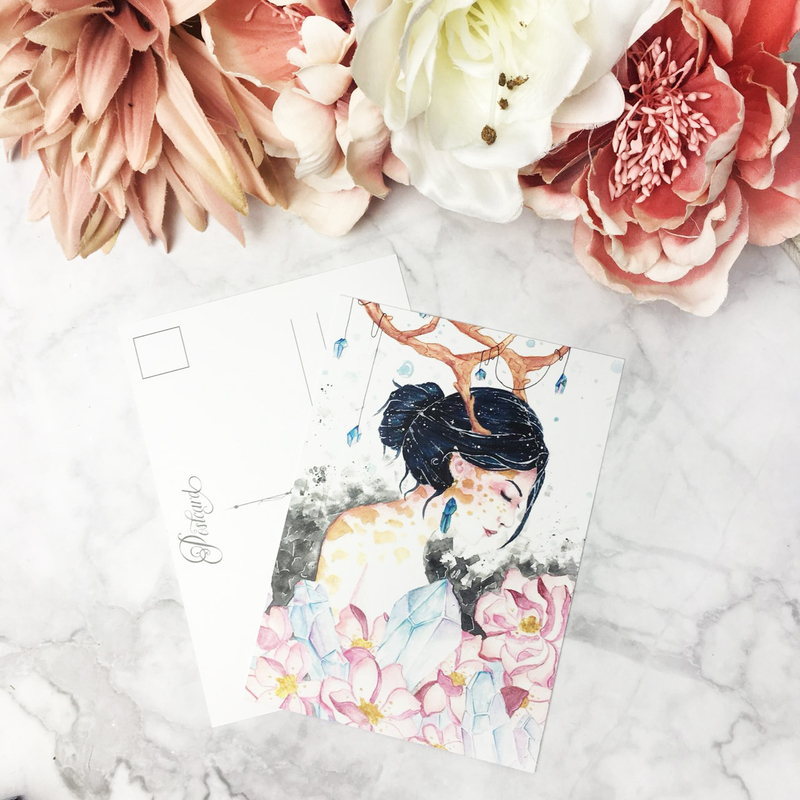 A cute watercolor postcard showing a woman with deer horns surrounded by flowers and crystals. 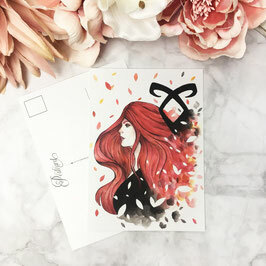 A cute watercolor postcard inspired by The Mortal Instruments. Showing Clary Fray. A cute watercolor postcard showing Feyre from the ACOTAR-series! 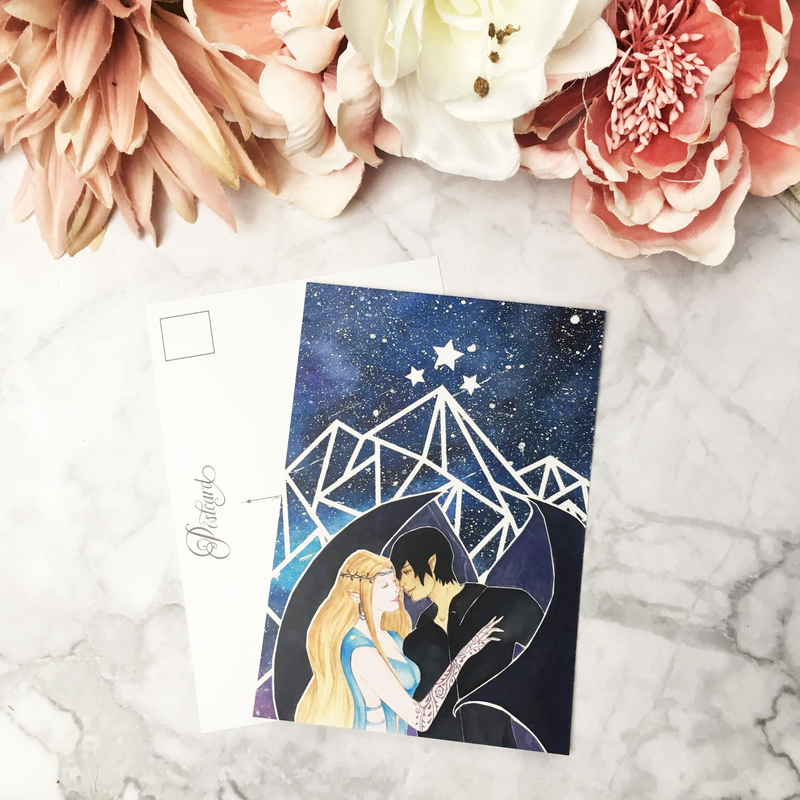 A cute watercolor postcard showing Feyre and Rhysand from the ACOTAR-series! 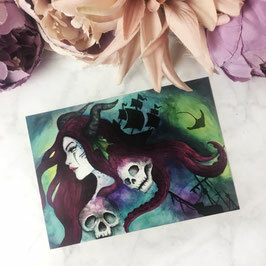 A cute watercolor postcard showing Lira from To Kill A Kingdom! 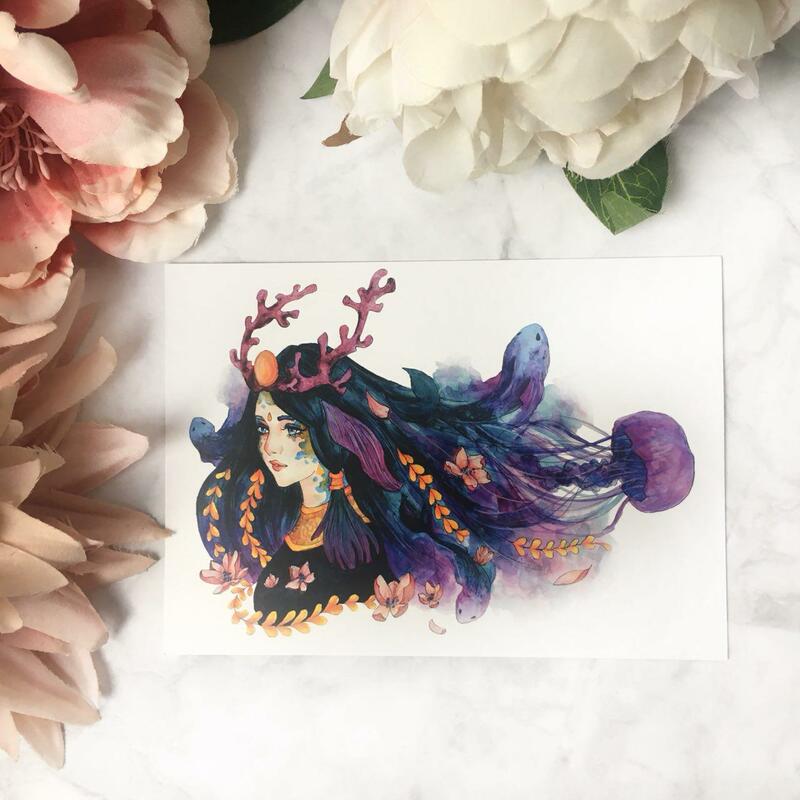 A cute watercolor postcard showing an oceanic inspired woman! 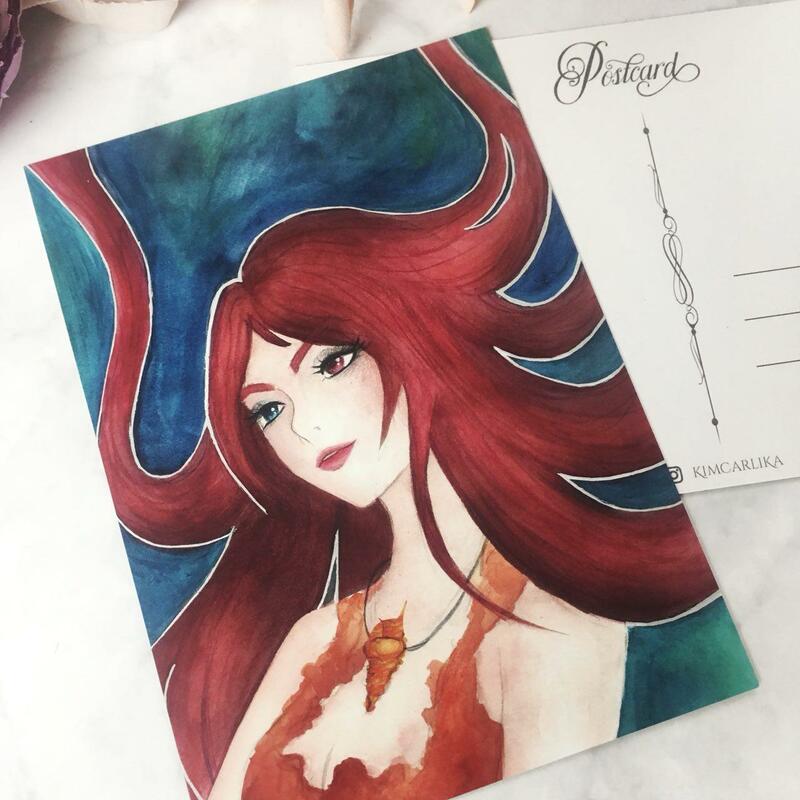 A cute watercolor postcard showing my own character Ophelia, the Sea Enchantress! 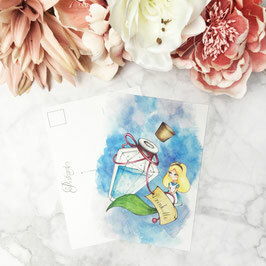 A cute watercolor postcard showing Alice and the Drink Me Potion from Alice in Wonderland! A cute watercolor postcard showing Red Riding Hood and the Big Bad Wolf. 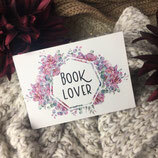 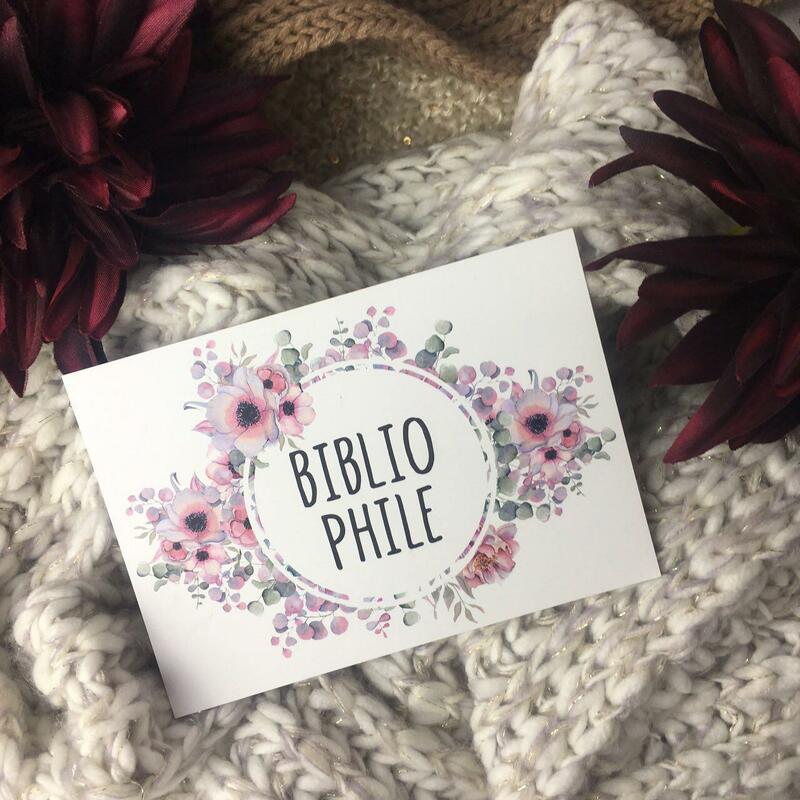 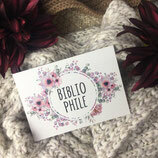 Cute postcard illustrating the word "Booklover"
Cute postcard illustrating the word "Bibliophile"
Cute postcard illustrating Belle from Beauty and the Beast.